Hello! In this article I would like to show you three techniques that if you don’t know any martial art, just these three techniques will be useful for you! When someone in the street comes in front of you to attack you, the first thing to do is take your hands up, not properly in a fighting position, just only to keep the distance between you and your opponent and to be ready in case of suddenly attacks. Remember this: some people come to you in a not aggressive mode and then they hit you with a hook fist or a headbutt! So all the time you have to take your hands up: this is the first rule! Don’t try to punch! Don’t try to grab you opponent! If your opponent is a wrestler and you try to grab him you will go to the ground! But you don’t want to go to the ground so don’t try to grab him!!! So with your hands up you have to do a very simple thing: kick your opponent to the groin. According to his position you have to kick him with your left leg or right leg. For example: if your opponent has the left leg forward you have to kick him to the groin with your left leg because, if you tried to kick him with your right leg, you would kick his left leg! If he has the two legs in a parallel position you can hit him with your left leg or right leg: it would be the same. So you have to hit his head and back with one or two hands: hit, hit, hit! Then you can give him another kick to the groin and that’s it! I repeat: you have to know these three steps and you will be able to do something in the street! When your opponent will come: hands up in order to say “Keep distance, keep distance!”, then kick to the groin, then hit hit hit with hummer fist his head and back, then kick to the groin again until he will go down. 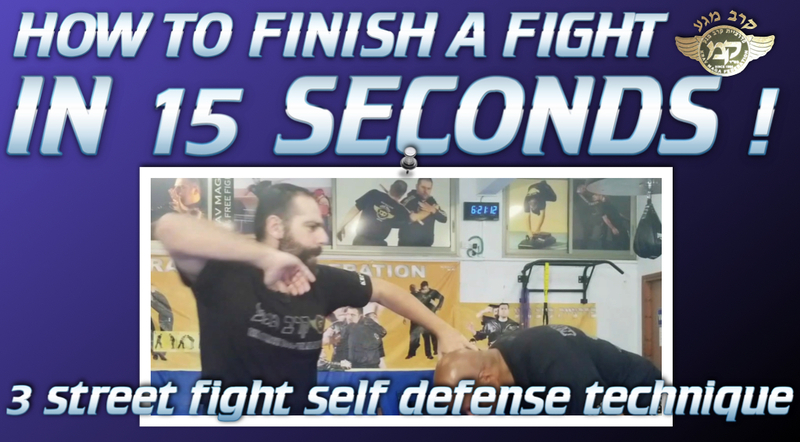 It is simple, it is efficient: this is Krav Maga!